The $80 million profit Walt turned by selling meth for just one year is a very realistic sum for a true-life drug kingpin. Walter White may be fictional. But the $80 million profit he turned by selling meth in less than a year is a very realistic sum for a true-life drug kingpin. It's not until the last season of Breaking Bad that viewers learn just how much cash their favorite meth-making anti-hero has accumulated by cooking crank. The $80 million is a staggering sum for less than a year's worth of work. 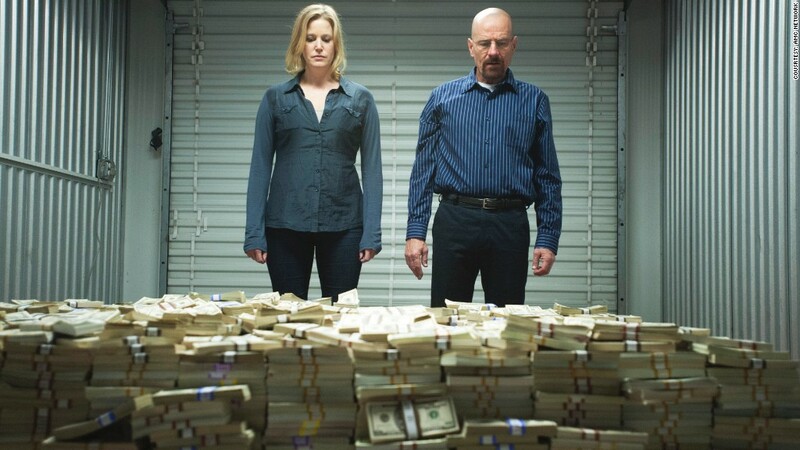 But experts say that pallet full of cash portrayed in the show is realistic, given the economics of the meth trade. "The show has a lot of reality to it," said Ralph Weisheit, a professor of criminal justice at Illinois State and an author of the book, "Methamphetamine: Its History, Pharmacology and Treatment." "It clearly employs consultants who know a lot of about the business," he added. The story of a quiet high school chemistry teacher who built a crystal methamphetamine empire will air its series finale on Sunday, amid strong ratings for AMC Networks (AMCX) and even stronger buzz. Walt's fortune is built on the premise that he's selling his meth at the modest price of about $60 a gram. That's spelled out in the fifth season episode "Hazard Pay," when Walt and his partners sell a 50 pound batch of their high quality blue meth for $1,379,560, after the commission that goes to street dealers. According to Weisheit, $60 a gram "is not at all unreasonable, especially for meth of a very high quality." "The price of meth varies wildly from one part of the country to another, and from one time a year to another, depending on supplies," he added. "It can go from $50 a gram to $150 a gram. It makes oil prices look stable." It's a long way from $60 for a gram of meth to the seven, 55-gallon drums of cash Walt has holding $80 million. But the volumes of meth on the show are enough to produce that mountain of cash. And the demand for the product is strong enough that Walt could move that much meth in less than a year, especially given his empire's expansion into eastern Europe this season. Walt was able to make such a large volume of meth because he and his partners stole 1,000 gallons of the industrial chemical methylamine from a train. After the heist, Walt's partners want to sell the chemical for $15,000 a gallon, instead of cooking it up into meth and selling it. On the black market, that's a reasonable price for the chemical, says Weisheit. But Walt argues that if he cooks the methylamine, he and his partners can make far more money - somewhere between $300 million and $370 million. Using the retail price of $60 a gram, that means they'd have to sell between 11,000 and 13,500 pounds of meth. And as it turns out, the 1,000 gallons of methylamine they stole would produce anywhere from 10,000 to 13,000 pounds of very pure meth, according to Steve Preisler, a chemist who wrote the book "Secrets of Methamphetamine Manufacture" while serving time in prison on meth charges. Walt cooks almost 400 gallons of the methylamine before deciding to quit the business. He agrees to pay another drug dealer a 35% cut of his sales in return for handling the distribution. That would net Walt between $78 million to $96 million in profit, or enough to fill those seven 55-gallon drums with cash.